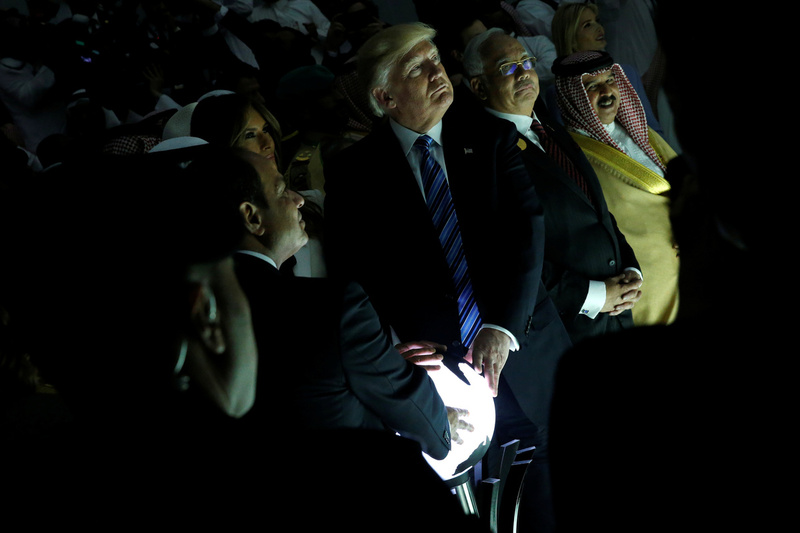 Here's The Deal With That Glowing Orb — And Plenty Of Notes On What It Isn't : The Two-Way It seemed an innocuous gesture: President Trump joined two other world leaders in laying their hands on a lit-up globe at an event in Saudi Arabia. Then, Twitter caught wind of it. Together with Egyptian President Abdel-Fattah el-Sissi and Saudi King Salman bin Abdul-Aziz Al Saud, President Trump touches a lit-up globe that activated a video at the inauguration of the Global Center for Combating Extremist Ideology in Riyadh, Saudi Arabia. It's pretty safe to say President Trump did a few attention-grabbing things this weekend on the first leg of his first foreign tour in office. He delivered an address to the leaders of Muslim-majority countries, for instance, and took part in a sword dance with Saudi leaders in Riyadh. And as you might have heard, he also touched a glowing orb. At the gala inauguration of the Global Center for Combating Extremist Ideology — an institution billed as a cooperative effort to confront extremism "by the latest intellectual, media and numerical methods and means" — Trump joined Saudi King Salman bin Abdul-Aziz Al Saud and Egyptian President Abdel-Fattah el-Sissi in laying their hands on a lit-up globe. Here's how the Saudi Gazette put it: "Trump and the King each placed their hands on a miniature globe that officially activated the center and launched a splashy welcome video." Then, they continued to palm the sphere for about a minute and a half as they watched, lights dimmed and orb aglow — while cameras snapped away. Which, of course, means Twitter noticed, too. Ever helpful and earnest, our fair friends on social media quickly stepped in to clarify the situation for befuddled onlookers. That is, they offered a few suggestions about what it's fairly safe to say Trump did not do. And they offered a lot of them. For instance, it's pretty safe to say Trump did not break a campaign pledge to resist the all-knowing orb's deceitful and deadly attractions. He probably did not make a wish, negotiate with the glowing orb or see his future. Mark our words: He did not even sic a troop of orcs on the heroic, if reluctant and undersized, possessor of the One Ring to Rule Them All. Sure, we'll admit the possibility Trump disappointed campaign rival Jeb Bush. But it also appears he did not impress Breitbart, a media outlet that has ties to his administration and quite often has his back at moments such as these. And finally, let's be very, very clear on this point: Trump did not take part in a satanic ritual.